Ten years after the second great depression, Americans struggle to recover from the country’s recovery activities in Harvesting Ashwood: Minnesota 2037, the third speculative fiction novel by prize-winning author Cynthia Kraack. As colossal-size government, necessary during the chaos of international financial collapse, is reluctant to downsize its power and activities as business re-asserts its claim to sharing direction of the U.S. economy. How do quasi-governmental units established to feed, shelter and educate citizens navigate the developing power struggle of an ever-changing order? 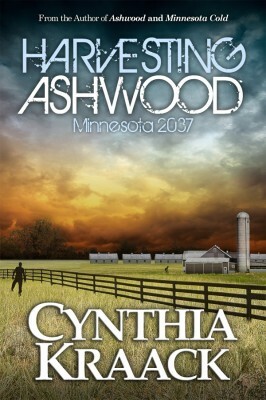 Harvesting Ashwood: Minnesota 2037 builds on the tradition of Ashwood by challenging today’s status quo within the twists and turns of a spellbinding thriller. Kraack explores social issues from today’s culture in a different future. From the basic right of people to daily food to the complex relationship the United States has with its children, the Ashwood series pushes readers to question the trade-offs made by politicians under the pressure of military expansion or international diplomacy. Harvesting Ashwood: Minnesota 2037 follows Anne Hartford, owner and general manager of a former government agricultural installation named Ashwood, through challenges that threaten the continued profitability of raising crops for both the public and private markets, the illogical infringement of the military on her operation, and policy that could destroy her family. Trained to be an elementary teacher in the early twenty-first century, she creates a safe haven for many children sucked into government-assigned training even while worrying about a tenuous hold on her own sons and daughter. Cynthia Kraack’s first speculative fiction work, Minnesota Cold, won the 2009 Northeastern Minnesota Book Award for Fiction. She is a graduate of Marquette University’s College of Journalism and holds a Master’s in Labor Economics and Educational Psychology from the University of Minnesota as well as a Masters in Creative Writing from the University of Southern Maine. She has spent years in corporate management, consulting and freelance writing.